Make 4 payments of $46.58 over 8 weeks and get it now! New Genuine Toyota Land Cruiser 70 Series Sunvisor Jan 2007 onwards. We all love sunny days, but they can also make for more difficult driving conditions. Sunvisors are a discreet addition to the front exterior of your car and provide superb coverage. Toyota Genuine Sunvisors are designed to minimise strong sunlight and glare in the cabin, making driving more comfortable. The durable metal construction can withstand harsh elements and the Sunvisor is primed and can be painted to match your vehicle's exterior. 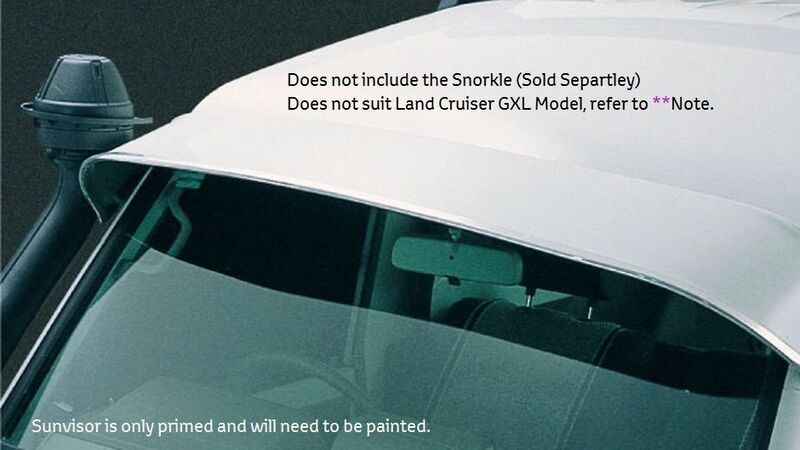 ** Note: This Sunvisor does not suit the GXL Land Cruiser due to the GXL Land Cruiser having Chrome Molds on the Roof Weather Strips, if you wish to fit this item to a GXL Land Cruiser the Chrome Molds will need to be removed prior to fitting.